If you’re a romance reader, you’re probably already a Lori Copeland fan and all I have to say is, “She’s done it again.” If you’re not a fan of romance novels I still think the tension and humor in Tom and Mae’s story will hold your interest, peak your worry and tickle your funnybone. 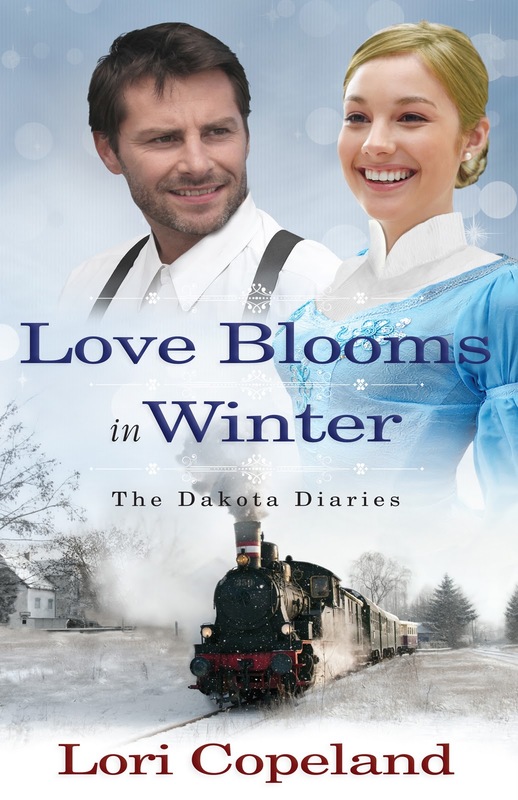 Despite being set during the historic blizzard of 1892, Love Blooms in Winter, managed to leave a smile on my face and a warm glow in my heart. This book was a fun read. Lori Copeland is the author of more than 90 titles, both historical and contemporary fiction. With more than 3 million copies of her books in print, she has developed a loyal following among her rapidly growing fans in the inspirational market. She has been honored with the Romantic Times Reviewer’s Choice Award, The Holt Medallion, and Walden Books’ Best Seller award. In 2000, Lori was inducted into the Missouri Writers Hall of Fame. She lives in the beautiful Ozarks with her husband, Lance, and their three children and five grandchildren. This new romance from bestselling author Lori Copeland portrays God’s miraculous provision when none seems possible. An engagement, a runaway train, and a town of quirky, loveable people make for more adventure than Tom Curtis is expecting. But it is amazing what can bloom in winter with God in charge. 1892—Mae Wilkey’s sweet next-door neighbor, Pauline, is suffering from old age and dementia and desperately needs family to come help her. But Pauline can’t recall having kin remaining. Mae searches through her desk and finds a name—Tom Curtis, who may just be the answer to their prayers. Tom can’t remember an old aunt named Pauline, but if she thinks he’s a long-lost nephew, he very well may be. After two desperate letters from Mae, he decides to pay a visit. An engagement, a runaway train, and a town of quirky, loveable people make for more of an adventure than Tom is expecting. But it is amazing what can bloom in winter when God is in charge of things. The winter of ’92 is gonna go down as one of the worst Dwadlo’s ever seen,” Hal Murphy grumbled as he dumped the sack of flour he got for his wife on the store counter. “Mark my words.” He turned toward Mae Wilkey, the petite postmistress, who was stuffing mail in wooden slots. “Yes, ma’am.” Hal nodded to the store owner, Dale Smith, who stood five foot seven inches with a rounded belly and salt-and-pepper hair swept to a wide front bang. “Add a couple of those dill pickles, will you?” Hal watched as Dale went over to the barrel and fished around inside, coming up with two fat pickles. Smiling, Mae moved from the letter boxes to the cash box. Icy weather may have delayed the train this morning, but she still had to count money and record the day’s inventory. “Now, Hal, you know I’d marry you in a wink if you weren’t already taken.” Hal and Clara had been married forty-two years, but Mae’s usual comeback never failed to put a sparkle in the farmer’s eye. Truth be, she put a smile on every man’s face, but she wasn’t often aware of the flattering looks she received. Her heart belonged to Jake Mallory, Dwadlo’s up-and-coming attorney. The little prairie town was formed when the Chicago & North Western Railroad came through five years ago. Where abundant grass, wild flowers, and waterfalls had once flourished, hundreds of miles of steel rail crisscrossed the land, making way for big, black steam engines that hauled folks and supplies. Before the railroad came through, only three homesteads had dotted the rugged Dakota Territory: Mae’s family’s, Hal and Clara’s, and Pauline Wilson’s. But in ’87 life changed, and formerly platted sites became bustling towns. Pine Grove and Branch Springs followed, and Dwadlo suddenly thrived with immigrants, opportunists, and adventure-seeking folks staking claims out West. A new world opened when the Dakota Boom started. Mae sighed. Hal was a pleasant sort, but she really wished the townspeople would occupy their thoughts with something other than her and Jake’s pending engagement. True, they had been courting for six years and Jake still hadn’t proposed, but she was confident he would. He’d said so, and he was a man of his word—though every holiday, when a ring would have been an appropriate gift, that special token of his intentions failed to materialize. Mae had more lockets than any one woman could wear, but Jake apparently thought that she could always use another one. What she could really use was his hand in marriage. The bloom was swiftly fading from her youth, and it would be nice if her younger brother, Jeremy, had a man’s presence in his life. “Apparently six years and counting.” She didn’t like the uncertainty but she understood it, even if the town’s population didn’t. She had a good life, what with work, church, and the occasional social. Jake accompanied her to all public events, came over two or three times a week, and never failed to extend a hand when she needed something. It was almost as though they were already married. “Not likely in Dwadlo,” Mae mused. The town itself was made up of less than a hundred residents, but other folks lived in the surrounding areas and did their banking and shopping here. Main Street consisted of the General Store, Smith’s Grain and Feed, the livery, the mortuary, the town hall and jail (which was almost always empty), Doc Swede’s office, Rosie’s Café, and an empty building that had once housed the saloon. Mae hadn’t spotted a sign on any business yet advertising “Husbands,” but she was certain her patience would eventually win out. With a final smile Hal moved off to pay for his goods. Mae hummed a little as she put the money box in the safe. Looking out the window, she noticed a stiff November wind snapping the red canvas awning that sheltered the store’s porch. Across the square, a large gazebo absorbed the battering wind. The usually active gathering place was now empty under a gray sky. On summer nights music played, and the smell of popcorn and roasted peanuts filled the air. Today the structure looked as though it were bracing for another winter storm. Sighing, Mae realized she already longed for green grass, blooming flowers, and warm breezes. After Hal left Mae finished up the last of the chores and then reached for her warm wool cape. She usually enjoyed the short walk home from work, but today she was tired—and her feet hurt because of the new boots she’d purchased from the Montgomery Ward catalog. On the page they had looked comfortable with their high tops and polished leather, but on her feet they felt like a vise. Dale always reminded Mae of an owl perching on a tree limb, his big, dark blue eyes swiveling here and there. He might not talk a body’s leg off, but he kept up on town issues. She admired the quiet little man for what he did for the community and respected the way he preached to the congregation on Sundays. How was Pauline doing? Mae worried the question over in her mind. Pauline lived alone, and she shouldn’t. The elderly woman was Mae’s neighbor, and she checked on her daily, but Pauline was steadily losing ground. “Hmm…me neither. But surely she must have some.” Someone who should be here, in Dwadlo, looking after the frail soul. Mae didn’t resent the extra work, but the post office and her brother kept her busy, and she really didn’t have the right to make important decisions regarding the elderly woman’s rapidly failing health. Nodding, he continued sweeping, methodically running the stiff broomcorn bristles across the warped wood floor. The numbing wind hit Mae full force when she stepped off the porch. Her hood flew off her head and an icy gust of air snatched away her breath. Putting down her basket, she retied the hood before setting off for the brief walk home. Dwadlo was laid out in a rather strange pattern, a point everyone agreed on. Businesses and homes were built close together, partly as shelter from the howling prairie winds and partly because there wasn’t much forethought given to town planning. Residents’ homes sat not a hundred feet from the store. The whole community encompassed less than five acres. Halfway to her house, snowflakes began swirling in the air. Huddling deeper into her wrap, Mae concentrated on the path as the flakes grew bigger. She quickly covered the short distance to Pauline’s. The dwelling was little more than a front room, tiny kitchen, and bedroom, but she was a small woman. Pauline pinned her yellow-white hair in a tight knot at the base of her skull, and she didn’t have a tooth in her head. She chewed snuff, which she freely admitted was an awful habit, but Mae had never heard her speak of giving it up. Her faded blue eyes were as round as buttons, and no matter what kind of day she was having, it was always a new one to her, filled with wonders. Her mind wasn’t what it used to be. She had good and bad days, but mostly days when her moods changed as swift as summer lightning. She could be talking about tomatoes in the garden patch when suddenly she would be discussing how to spin wool. Mae noted a soft wisp of smoke curling up from the chimney and smiled. Pauline had remembered to feed the fire this afternoon, so this was a good day. Unlatching the gate, she followed the path to the front porch. In summertime the white railings hung heavy with red roses, and the scent of honeysuckle filled the air. This afternoon the wind howled across the barren flower beds Pauline carefully nurtured during warmer weather. Often she planted okra where petunias should be, but she enjoyed puttering in the soil and the earth loved her. She brought fresh tomatoes, corn, and beans to the store during spring and summer, and pumpkins and squash lined the railings in the fall. In earlier days Pauline’s quilts were known throughout the area. She and her quilting group had made quite a name for themselves when Dwadlo first became a town. Four women excelled in the craft. One had lived in Pine Grove, and two others came from as far away as Branch Springs once a month to break bread together and stitch quilts. But one by one the women had died off, leaving Pauline to sew alone in her narrowing world. Mae stepped back and waited to hear the shuffle of feet. Pauline used to answer the door in less than twenty seconds. It took longer now. Mae made a fist with her gloved hand and banged a little harder. The wind howled around the cottage eaves. She closed her eyes and prayed that Jeremy had remembered to stack sufficient firewood beside the kitchen door. The boy was generally responsible, and she thanked God every day that she had him to lean on. He had been injured by forceps during birth, which left him with special needs. He was a very happy fourteen-year-old with the reasoning power of a child of nine. A full minute passed. Mae frowned and tried the doorknob. Pauline couldn’t hear herself yell in a churn, but she might also be asleep. The door opened easily, and Mae peeked inside the small living quarters. She saw that a fire burned low in the woodstove, and Pauline’s rocking chair sat empty. The ticking of the mantle clock was the only sound that met her ears. “Pauline?” She lowered her hood and walked through the living room. She paused in the kitchen doorway. You’re right! It is indeed a great read. Good thing too, ’cause I accidentally signed up for both the FIRST and CFBA tours! Only one copy of the book, but I’ll be posting about it twice! Linda, I can easily see how the excitement of being offered a Lori Copeland book could lead to double booking. Luckily, given the dementia aspect, the fact that the winter depicted in this book was an historic killer, and the aspects of Christian community addressed in the story, I think you could easily write a dozen different posts on the novel. Stopping by a little late, but glad I did nonetheless. This first chapter had me wanting to read the rest of the book!